The following is a response to a New York Post article called ‘Surprise period pants’ is the worst Halloween costume idea,” by Molly Shea. Molly did not contact me for comment and did not respond when I reached out to her. Last week, I made a video called “5 Halloween Costumes That Are *Actually* Scary.” I wanted to highlight some very real-life horrors that scare me on a daily basis, including a surprise period and generalized anxiety. These are two very normal human issues that are hard to talk about because the fear and stigma surrounding women’s health are terrifying. My solution? Dress up as what scares you. So to get into the Halloween spirit, I personified these stigmas. Terrify your friends with these homemade Halloween costumes! 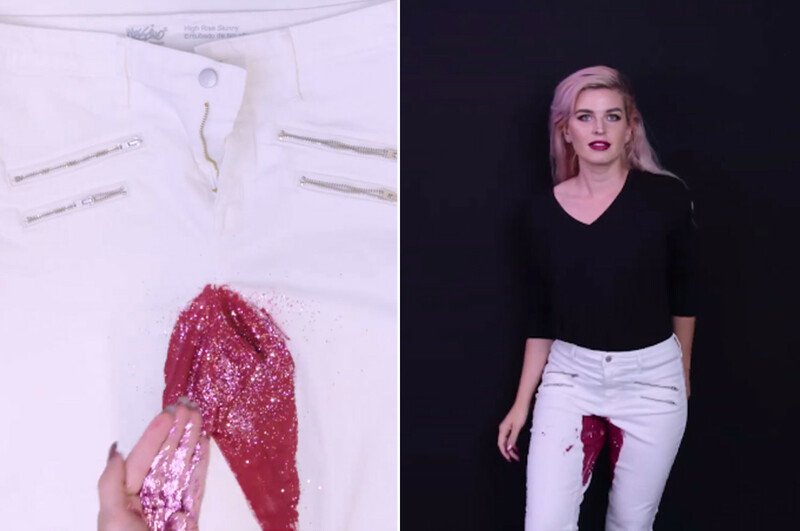 As you can see in the video, I put red paint on a pair of white pants — the ultimate symbol for a surprise period. Painting those white pants was my way of taking control, starting the conversation on my terms. The glitter, to be honest, was just for flare. Why are women’s bodily functions less acceptable to talk about than clowns who eat children? In the video, I also dressed as “generalized anxiety” by writing the words on a shirt in glow-in-the-dark paint. 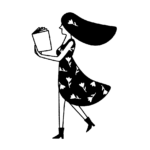 It represented the many who live with anxiety and keep their discomfort hidden. Why are we okay with our co-workers discussing their sinus infections ad nauseam, but we feel too humiliated to talk openly about mental illness? I wanted to explore the way we do and do not talk about the things that make us human. The New York Post used “surprise period pants” (and my face!) to perpetuate the shame women feel about their bodies and their health. In the article, author Molly Shea, falsely reported that the comment section of my video was riddled with “thousands of angry social media followers.” She’s doing the smart, generous, and witty 25k commenters a disservice. And people who bravely shared their unique experience with generalized anxiety disorder. Commenters discussed the line between perpetuating stigma and raising awareness, which is so, so important. The New York Post deeply missed the point of “5 Halloween Costumes That Are *Actually* Scary.” Women feel scared to bleed through their pants because they don’t want to be defined by that one time their tampon failed them. They are scared to speak openly about their mental health because they don’t want to be seen as weak or less than. My periods are irregular, so they are never NOT a surprise. I’ve bled on my middle school uniform, my grandmother’s white couch, church pews, boyfriends’ sheets, and every single pair of jeans I own. Most recently, I sat up after a company meeting and realized I’d been free bleeding for the entire hour. I don’t get embarrassed easily (hello, I make videos for the internet), but I’ve considered taking a sick day to avoid the embarrassment of people seeing my inevitable bloodstain. I know I’m not alone in this struggle, so I made this video about unpredictable periods (below) a few months ago. My goal was that other women like me would see it and connect over the unavoidable weirdness that is blood on our underwear! When your cycle is less of a period, more of a question mark. Our bodies do things that are out of our control. That’s not the scary thing, though. The scary thing is that women don’t feel comfortable talking about it because of, well, the world. I mean, our government sees women’s health like plastic silverware — disposable. According to the Trump administration, women’s health is a “pre-existing condition,” instead of, uh, A CONDITION CALLED LIVING LIFE. So not only do women feel like their health is disregarded and policed, but they also have to worry about the costs. No wonder periods are still considered a taboo topic of conversation. For me, anxiety and mental health are harder to talk about. This essay about how I use clothes to battle depression took me weeks to write because I kept spiraling over the topic. This video (below) about anxiety is less than thirty seconds long, but I spent months debating whether or not I should actually make it. Of course, that video is a metaphor. The truth is, my anxiety (and its BFF, depression) causes symptoms I never knew were associated with mental illness until I started seeing a psychiatrist this year. When my mental illness is at its worst, I’m exhausted all the time but I can’t sleep, I’m irritable, I can’t keep eye contact, I say something COMPLETELY NORMAL but go over it in my head for hours, sometimes days, convinced I am wrong, everything is wrong. I pick fights, I cry in the elevator at work, and I’ve had dark thoughts I’m not ready to share on the internet. When I’m overcome with anxiety. I’m not myself. I’m myself with anxiety. It’s important that people understand this, so please imagine I’m yelling: MENTAL HEALTH IS DIFFERENT FOR EVERYONE. I repeat, MENTAL HEALTH IS DIFFERENT FOR EVERYONE. The worst part of anxiety (for me), is that it’s not always visible. Unlike physical pain or trauma, anxiety and other mental health disorders can be impossible to detect — and the difference in how we react to those conditions is striking. If I had a broken leg and was crying in the elevator at work, people wouldn’t think “she’s just feeling sorry for herself,” (something I’ve been accused of) or that the way I’m feeling is a choice. The fact that many don’t treat mental illness the same way we treat other afflictions is a problem. So I created a costume that reflected my fear. I used glow-in-the-dark paint to write “generalized anxiety” on my shirt. In the light of day, no one can see it, but it’s in the darkest corners of the mind where anxiety shines brightest. Yeah, the video is light-hearted and funny, but I meant it when I called it *actually* scary. “Surprise Period” is not the worst Halloween costume ever and HelloGiggles commenters are not “angry” (at least, most of them aren’t — see for yourself) despite the narrative of outrage the New York Post tried to create. I’m so proud of the conversations in the comment section of this video. Our viewers are fierce and smart, and those of you who shared your stories inspired me to share mine. I understand that the video didn’t resonate with everyone, but I hope this long diary entry HG just let me publish on their website clarifies that I was not making fun of anxiety or anyone who suffers from it. The illness, no. The stigma around it, yes. Talking about these stigmas can help make them go away. Laughing at them might make the process even faster. Until then, I will keep making videos about surprise periods until they aren’t shocking anymore.